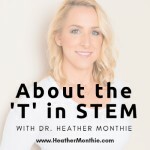 About the 'T' in STEM is the newest podcast to join the Education Podcast Network as of January 2019. The 'T' in STEM education - Discussing technology, education, & innovation for teachers, parents, and educational leaders. Sharing about technology education, digital literacy, computer science for all, cybersecurity education, and STEM education with a side of aviation! Dr. Heather Monthie has been involved in the tech world since the mid-1990s and made her way into technology education in 2003. Heather became an educator because she wanted to help people change the trajectory of their lives. She firmly believes that through education and application, you can have the impactful career that you want, the lifestyle you want, and have a significant effect on changing the world.